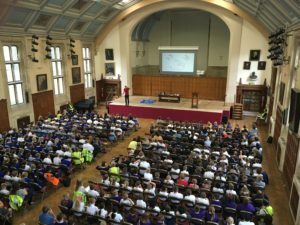 We celebrated the end of another successful year of the Canterbury Primary Science Partnership with our end of term science talk in the Shirley Hall. Over 420 pupils and their teachers from 7 local primary schools attended a talk by Greg Foot. Greg is one of the leading science communicators in the UK, a successful science presenter with over 20 million views on YouTube and multiple TV series with the BBC. Greg spoke about his aquanaut adventures in the deep ocean and, with footage shot in the submersible, live experiments and demonstrations the audience were amazed at this hidden world. They were introduced to the science involved in deep sea exploration and met a newly discovered species of crab! There were lots of inspiring and interesting questions from the pupils at the end of the talk and wonderful feedback from teachers. Teachers have told us how animated and inspired the children were about what they had learnt, excited to report back to their schools about Greg’s talk. They also told us how the event had sparked a wider debate about plastics in our oceans and global warming. One pupil from Sturry CEP School said ” it was amazing, he made it really interesting and I now know stuff I didn’t before, I can’t wait to tell my dad about it”. We look forward to the coming year of CPSP projects and our next science talk in 2019!